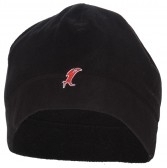 VICIOUS SKULL CAP 100% Polyester waterproof fleece. One size fits all. Black with Vicious logo.